Will Jays’ stance over $450K ultimately cost them their MVP? Baseball teams do dumb things all the time, but I can’t think of many dumber than going to arbitration with a newly crowned MVP over a difference of $450,000. 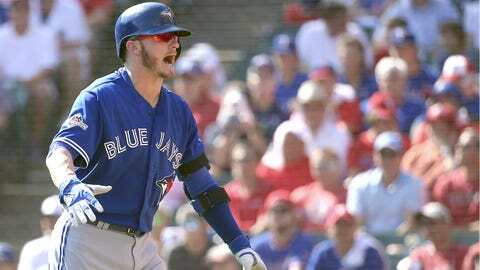 That’s where the Blue Jays are headed with third baseman Josh Donaldson, straight to a hearing. The Jays, as a file-and-trial team, will not negotiate further on a one-year contract after arbitration numbers are exchanged. But now they very likely have damaged their relationship with Donaldson, a proud, emotional sort who will not forget this slight. It has been a quarter-century since a team went to an arbitration hearing with a reigning MVP, according to bizofbaseball.com — the Pirates beat Barry Bonds in 1991, paying him $2.3 million instead of his requested $3.25 million. The Phillies went to a hearing with Ryan Howard and lost in 2008, but that arbitration season was a year after he was MVP. The Jays beat Donaldson in arbitration a year ago, beat him just months after acquiring him in a trade. Donaldson bears responsibility for that dispute ending up in a hearing — he overreached by asking for $5.75 million, and the Jays won the case at $4.3 million. But considering how small the split is this time, it’s the Jays who look small-minded, taking a business-first approach to an extreme. The solution would be for the two sides to negotiate a multi-year deal before getting to a hearing; Donaldson has three years of arbitration remaining, including this one. The first-year number would be easy — $11.575 million, the midpoint between the Jays’ offer of $11.35 million and Donaldson’s request for $11.8 million. Think everyone involved could figure out the rest? Donaldson was not going to make the same mistake again and ask for say, $14 million; the advantage of the file-and-trial system is that it generally forces both sides to be more realistic with the numbers they exchange, knowing that the arbitration panel will pick one or the other. So, why weren’t the Jays more flexible? Yes, Davis had more home runs and RBI in 2013 than Donaldson had in ‘15. But Donaldson is a better defender, was the leading vote-getter for the All-Star Game, helped lead the Jays to the playoffs and — need I repeat myself? — won the freaking MVP! That award alone should have persuaded the Jays to go higher; virtually all long-term contracts include MVP bonuses. But the suspicion on the players’ side is that Jays assistant GM Andrew Tinnish, who handles the team’s arbitrations, was trying to prove a point, and perhaps impress his new boss, team president Mark Shapiro. If that is the case, Tinnish need not have worried; the Jays’ success in arbitration is well-known throughout the industry. But now the team is in a box with a popular player who will remain part of the team’s core if right fielder Jose Bautista and first baseman Edwin Encarnacion depart as free agents at the end of the season (The Jays avoided arbitration with six eligible players, but also failed to settle with newly acquired right-hander Jesse Chavez). The Jays are not going to attack Donaldson before the three-person arbitration panel; how, for heaven’s sake, do you tear down an MVP? The dispute will simply be a question of which salary represents a fairer measure of Donaldson’s value, $11.35 million or $11.8 million. No matter, the dispute should not have even reached this point. With apologies to Jim Croce, you don’t tug on Superman’s cape, you don’t spit into the wind and you don’t go to arbitration with an MVP. The Yankees added payroll in other ways, trading for the remaining $38 million on second baseman Starlin Castro’s contract as well as the final year of closer Aroldis Chapman’s deal (Chapman requested $13 million in arbitration; the Yankees offered $9 million). They also acquired a player who is not yet eligible for arbitration, outfielder Aaron Hicks. The Mets, meanwhile, have committed little money beyond their modest free-agent signings — infielder Asdrubal Cabrera, outfielder Alejando De Aza, right-hander Bartolo Colon and reliever Jerry Blevins. Their acquisition of second baseman Neil Walker for left-hander Jon Niese essentially was a wash in salaries. And they presumably saved on outfielder Michael Cuddyer’s retirement, though it is not known how much they gave Cuddyer, if anything, as a buyout. Anyway, here’s the list as it currently stands. The numbers are based on reported, official major-league signings, and do not include the exercising of club options or players who were non-tendered and re-signed. It’s an interesting thought, considering that the Astros’ offseason to this point consists of acquiring reliever Ken Giles and re-signing reliever Tony Sipp and outfielder Colby Rasmus. But to create room for Cespedes, the ‘Stros probably would need to trade center fielder Carlos Gomez. That, too, is an interesting thought — Gomez is entering his free-agent year, employs Scott Boras as his agent and almost certainly will hit the open market. Rasmus, too, is a free agent at the end of the season, so the Astros might want to get another outfielder in place. Jake Marisnick or even George Springer could replace Gomez in center field. Here’s a thought of my own for Cespedes: The Yankees. The Yankees, like a number of other clubs, are wary of signing Cespedes long-term, according to major-league sources. Still, Cespedes would add star power — not to mention considerable talent — to a team that often seems to lack sizzle. Hal Steinbrenner’s father, the late George Steinbrenner, also would have relished the opportunity to embarrass the Mets. Three- or four-year opt-out (after 2018 or ’19): Jason Heyward, Cubs. An opt-out is perhaps best understood as a player option. Price’s seven-year, $217 million contract is effectively a three-year, $90 million deal with a four-year, $127 million player option. Tony Paul of the Detroit News tweeted Sunday night that the Tigers might be willing to sign Cespedes and exceed the threshold for that very reason — they likely would pay the penalty only once. ● Cubs right-hander Jake Arrieta requested $13 million in arbitration and the team offered $7.5 million — the biggest gap for any player who filed. Still, the Cubs are not a file-and-trial team, and a spread that large usually leads to a settlement. The midpoint of $10.25 million is barely above the $10.1125 salary that David Price received as a second-year arbitration eligible player after winning a Cy Young award — the same circumstance that Arrieta is in now. The midpoint of $11 million should provide a reasonable range for a settlement. Kenley Jansen, another closer in his final year of arbitration, settled with the Dodgers for $10.65 million. Chapman was slightly above him last season — $8.05 million to $7.4 million. Lucroy, who has a limited no-trade clause, remains a candidate to get moved. The Padres’ Derek Norris is another catcher who is available in trade.